Ah, pizza toast, how I love you! Pizza toast reminds me of being a kid. When my sister and I were old enough to come home from school and fix our own snacks, this became a favorite for me. My childhood version was slightly less cosmopolitan.... It usually consisted of a piece of white sandwich bread, a swipe of Ragu Pizza Sauce straight from the jar, and a pile of shredded cheddar cheese. Popped into the toaster oven for about 5 minutes- this constituted gourmet after school dining! Fast forward about 30 years (really? ouch!) and I've updated it a bit. I mentioned in an earlier post today that I bought a loaf of soft French bread to make the bananas foster French toast. It worked like a charm, but that means I had more than half a loaf of bread left to do something else with. Whilst rummaging around in the ice box searching for something to throw together for lunch, I spied the wrapped loaf on one of the higher shelves. 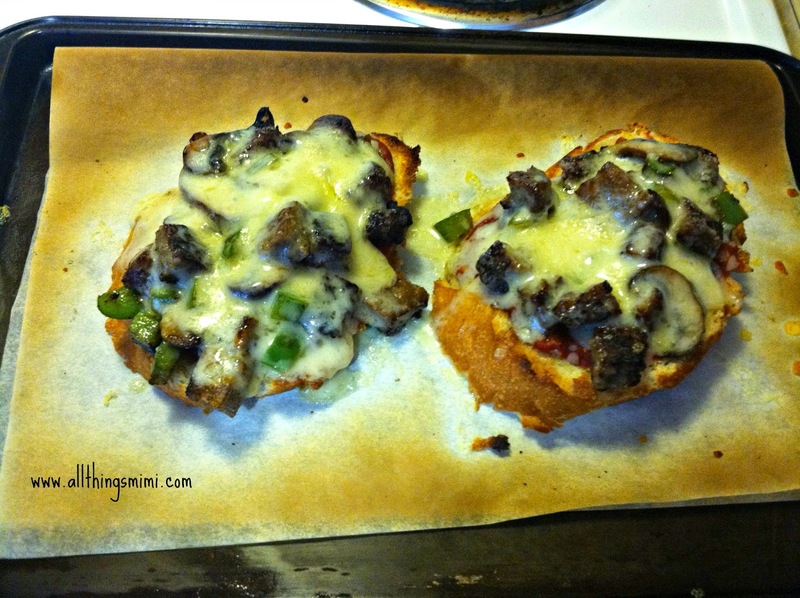 Suddenly, I had a blast from the past, and thought about making some pizza toast! Here's what I did: I lightly buttered both sides of the pieces of bread and toasted them in a skillet (mostly because I was going to use it to heat the other ingredients and I was too lazy to reach the toaster). I had a small container of pizza sauce left over from making pizza the other night, so I swabbed both pieces of bread with a healthy amount of the red sauce. In the same skillet, I put a small knob of unsalted butter, and after it melted and frothed, I added half a green pepper, chopped, about 3 mushrooms, thinly sliced, and 2 pieces of leftover breakfast sausage from the other morning, also chopped. As soon as everything was softened, I piled the veggies and sausage on the bread, then covered the toasts in a mixture of cheddar and swiss cheeses (because I had tiny ends of both in my cheese drawer). I put them under the broiler for a couple of minutes, until the cheese was bubbly and the edges were nice and brown.